A very well presented three bedroom end terraced house which has been modernised by the current owners. Located on the edge of Skipton the property benefits from a multi fuel stove, gas central heating, double glazing throughout and views of the canal to the front. ENTRANCE LOBBY Accessed via a uPVC door from the front garden, with dado rail and glazed door leading into the entrance hallway. ENTRANCE HALLWAY With ceiling coving and stairs leading up to the first floor landing. Doors lead into the living room and the dining room. LIVING ROOM 15′ 9" x 11′ 4" (4.82m x 3.47m) Good sized living room with high ceiling and original decorative ceiling coving, picture rail and recessed multi fuel stove with stone hearth. Wall shelving either side of the chimney breast. DINING ROOM 13′ 1" x 12′ 3" (max) (4.00m x 3.74m (max)) Lovely light room with picture rail, feature electric fireplace with slate hearth and laminate floor covering. Fitted reclaimed kitchen unit with built in full height larder fridge, storage drawers and cupboards and display cabinet. Doors lead to the kitchen and the rear porch. KITCHEN 10′ 11" x 4′ 5" (max) (3.33m x 1.37m (max)) Comprising a range of white wall and base units with laminate worksurfaces over and silver splash back wall tiling. Inset 1.5 bowl stainless steel sink with mixer tap. 4 ring electric hob with white extractor unit over, built under stainless steel electric oven and integrated dish washer. Under unit electric space heater and laminate floor covering. Under stairs storage area with wall shelving. REAR PORCH 3′ 6" x 3′ 1" (1.07m x 0.95m) Door from the dining room leads into the uPVC and glazed rear porch, with glazed door leading out to the rear yard. CONSERVATORY ROOM 8′ 7" x 6′ 9" (max) (2.64m x 2.06m (max)) Accessed from the rear yard via a glazed sliding door, with translucent roof covering, tiled floor and windows to two sides. Doors lead to the WC and the utility room. WC 4′ 11" x 2′ 5" (1.50m x 0.74m) Comprising a high level cistern WC with chain and tiled floor covering. UTILITY ROOM 5′ 11" x 4′ 9" (1.81m x 1.46m) With wall mounted Viessman gas combination boiler, worksurface with space under for a freezer and wall mounted Viessmann gas combination boiler. Tiled floor covering. FIRST FLOOR LANDING With doors leading to all three bedrooms, the shower room and steep staircase leading up to the attic. BEDROOM ONE 12′ 8" x 12′ 7" (3.88m x 3.85m) Good sized bedroom with built in wardrobes, exposed floor boards and view of the canal and tow path. 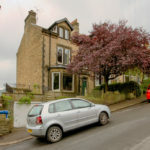 BEDROOM TWO 13′ 1" (max) x 12′ 3" (4.00m (max) x 3.74m) Another double bedroom with painted Victorian style fireplace and long distance valley views. BEDROOM THREE 9′ 6" x 7′ 3" (2.92m x 2.21m) Good sized single bedroom with a view of the canal and the tow path. SHOWER ROOM 7′ 1" x 5′ 4" (2.17m x 1.63m) Comprising a close couple dual flush WC, pedestal wash hand basin and corner shower enclosure with thermostatic shower. Splash panelling to two walls, chrome ladder towel rail and vinyl floor covering. Extractor fan. ATTIC 17′ 11" x 16′ 3" (5.47m x 4.96m) Accessed from the first floor landing, a steep staircase leads up to the attic room which is boarded and has light and power – currently used for storage. OUTSIDE To the front of the property there is an enclosed garden area, and to the rear there is a small enclosed yard. To the side of the property there is an off road parking area for two cars (currently used by our clients however not included within the title for the property). To the rear of the property is Bold Venture Park which has an activity play ground for young children and an open grassed area.